Learn to relate to and work more effectively with others through personal insights into your own behavioral strengths and challenges. 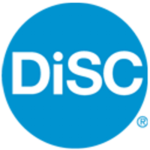 DiSC® is a personal assessment tool used by more than 40 million people to improve work productivity, teamwork and communication. It has been used worldwide in thousands of organizations of all sizes, major governmental agencies, and Fortune 500 companies. Want to take the survey or conduct a Disc workshop with your team?